In the name of transparency, I will admit to you that this is my favorite blend to smoke with no age on it. As a tobacco review man, I constantly go through the hills and valleys of what I love to smoke, but no matter what I do, Squadron Leader always reemerges as my favorite tobacco blend. However, I love this blend not only because the components are great, but I just love the Samuel Gawith company as a whole. I do not believe I could ever love a tobacco that came from a company that I didn’t respect. When it comes down to it, it is the absolute perfect smokability of this tobacco that I love. This is an adequately strong english blend that has gentle enough flavors to be smoked over and over again all day long. Not only can it be smoked all day, but the flavor seems to never diminish. I mean seriously, how many blends have you smoked that lost its flavor throughout the day? Probably most of them. This blend is available in bulk (select locations), 50g, and 100g tins. I prefer buying mine in the 50g rectangle tin. I find that this blend is best when smoked immediately after opening the tin and can dry out quickly if you are lackadaisical in smoking, so I avoid the 100g tin, just because it takes longer to smoke. Even though this blend is my favorite, I will find a balance between making this review personal, but not imposing my own presuppositions into the description. However, you owe it to yourself to try this world famous blend, no matter how contrived I may write this review. Squadron leader is blended with a delicate and high quality blend of dark and bright Virginias, Latakia, and a Turkish leaf. When I popped the tin I smelled nothing by the subtle rich aroma of a proper English tobacco. What excited me more than anything…no topping. I couldn’t find any evidence of flavoring in the aroma. Not that I have anything against a good casing, but for this tobacco, I just wanted a pure blend. As I mentioned above, there is a small amount of moisture right when you pop the tin. For some reason, my bowls seemed to smoke smoother at the top of the tin as opposed to the bottom. I credit this to the simple fact that the tin dried out over about a 2-3 week period. For this reason, I suggest you keep this open tin in a storage container, bag, or something else, just to help keep it perfectly moist. 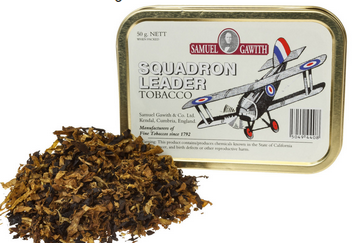 One of the reasons I love Samuel Gawith is that they package their ribbon cut tobacco, like Squadron Leader, in a rectangular tin. This make transporting and storing so much easier. It is one of those small details that is obvious but is seldom praised, which I seek to correct. If I had to choose one adjective to describe this blend, it would be Smooth. I understand that some smokers like blends that really bite and show off their strength in a piercing way; and occasionally I enjoy that as well. But for a daily go to smoke, I think most smokers prefer smooth blends. The reason this blend smokes to smooth is the ratio of bright Virginia to Latakia is more lopsided than usual. The flavor of this blend is very straightforward and not very overwhelming for an english blend. Mostly I tasted a very airy tobacco flavor. The Latakia was very tame, but still contributed smoke to the flavor. The Virginia combination added hints of sweetness here and there, but was not very prominent. And at the end, the Orientals gave it just a hint of a bite at the back of the throat, but was barely noticeable most of the time. What these components accomplish together is a flawless harmony of flavor. Each flavor builds and compliments the others, but only at certain moments. For the majority of the smoke, you are left to appreciate the gentle art of smoking a pipe with no interruption. Honestly, I have nothing at all bad, or even mediocre to say about smoking this blend. Now even though this blend tastes great, it is still an english blend. Non-pipe-smokers in the room may not be swooning at the whiff of Squadron Leader, but they won’t be turned off either. The smooth and gentle theme carries perfect continuity into the room. When the blend is noticed, you will not be mistaken for an amateur or a pretentious jerk, rather as an esteemed hobbyist. But, if you happen to be smoking around other pipe smokers, I guarantee you they will take notice of your blend. Their mouths will be watering to have a taste of your tobacco. How do I choose a drink to pair this tobacco with that would do it justice? I really enjoyed smoking this blend with a couple fingers of Woodford Reserve Double Oak Bourbon. However, to keep the larger bodied bourbon from overpowering the tobacco, I put in a splash of water. I figured if you are going to smoke the best of tobaccos, I better pair it with something pretty delicious. As I mentioned above, the main reason I love this blend is that I can smoke it throughout the day. It is never going to overwhelm my tastebuds. 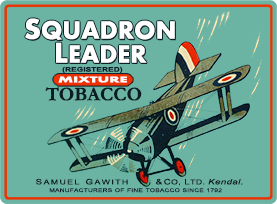 Squadron Leader is definitely a mild/medium bodied and tasting tobacco blend. I will admit something. Many of you who read my reviews or follow me on social media know that I am just a millennial. I am not saying that I do not know what I am talking about, but that I have a small tobacco cellar, and most of my blends have not had a decade to properly age. I believe, and other smokers will attest, that aging this blend will make it just about perfect. I give Squadron Leader a score of 9 out of 10. I know that some of you out there will find this blend to basic to love as much as I do, and that is perfectly fine. For me, this is the perfect standard for tobacco; this is a blend that all others should strive to emulate. But, I am sure that you will find loads of pleasure in smoking through a tin of Squadron Leader. Image provided by TobaccoPipes.com, Samuel Gawith, and PipeClubs. I’ve had Squadron Leader on my Need to Try list for a while. Your review has definitely bumped it up several spots! I strongly suggest you try it. I think you will find it very delicious. William – I tracked down a tin of SL at my local tobacconist and gave it a whirl. I remembered the words of your review – “straightforward”, “not overwhelming”, “airy tobacco taste.” Spot on, my friend. I found it very mild for an English blend, with a distinct “airy” quality to the flavour. Kind of like smoking outdoors when you’re indoors (though I don’t think the room note is quite so subtle). One of the few English blends I’ve tried that doesn’t make you feel the need to Febreeze your clothes before joining company for dinner. I am glad to hear that you tried it! Well, this is another one that I have meant to try but haven’t gotten to, mainly because I don’t like heavy Latakia blends and wasn’t sure about the content in this one. Your review sounds like this could be right up my alley though. I definitely wouldn’t be too intimidated by this blend. If you don’t like heavy Lat blends, then this one may taste stronger for you than me. But if you are looking to enjoy stronger tobacco and work your way up, then this is a good place to go. When I saw you mention you were going to review Squadron Leader on Instagram, I was excited to read your thoughts. This blend is currently at the top of my “to try” list, and your review only cements it there. For tackling a blend you already love, I think you did a good job explaining what you liked about it and balancing it with reasons someone might not like it. Also, I have to say Squadron Leader has some great tin artwork. And with a great name like “Squadron Leader”, it seems like the perfect blend to add to one’s rotation. Thank you for the response kind sir. It is very encouraging. I also love the artwork. I thought about mentioning that but I had already amassed a large word count and I didn’t want to ramble on. Thanks!! So, I did get around to trying this blend and I do like it – a lot! To me it is more flavorful than I expected from your review, likely because you were trying not to be biased! LOL Thanks for “putting me onto” this one! SL, one of my favorites…breaking in a new Nording with it as I write this. Great article! I am glad you liked the review. Thanks for the comment!